If you are ingesting calories why not do it in style ,enjoying every bite ,at the same time watching your waistline! The next best thing to make with cabbage after cabbage muthia is cabbage paratha. I used the same recipe for stuffing as I would do for gobi/ cauliflower paratha. 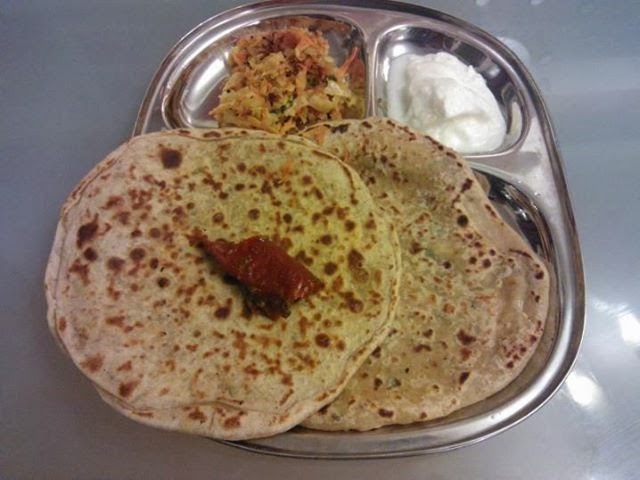 I had the best gobi paratha in Conoor, made by the cook there about 12 years back. I have been using the same recipe since then. 1. Get your partner or spouse to grate the cabbage using a food processor. 2. 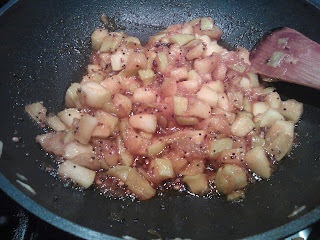 In a wok add oil, then the ajwain. When it splutters, add the ginger garlic paste and greenchillis. Saute till raw smell goes about 2min. Then add the cabbage and salt &cook till it soft and cooked. Add the spices and lastly add the coriander leaves and mix. 3. 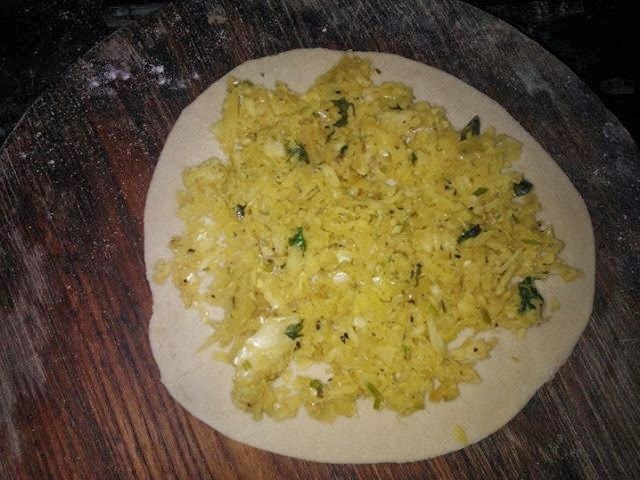 Make a soft dough as for chappathi . 4. Make two small thin chappathi. Add about 1.5-2 tbsp stuffing on one chappathi and cover it with second one.Pinch/fold the sides such that the stuffing doesn't come out. Roll them lightly gain to make a 5 mm thick paratha. 5. Cook on tava on both sides adding oil/ butter. Serve it hot with pickle and yoghurt. I think this is the best recipe to use apples from your garden whether its cooking apple or the sweet variety.This recipe was posted by Roshani and its been a hit in many household. I have already made it twice and am hoping to make it a few more times. 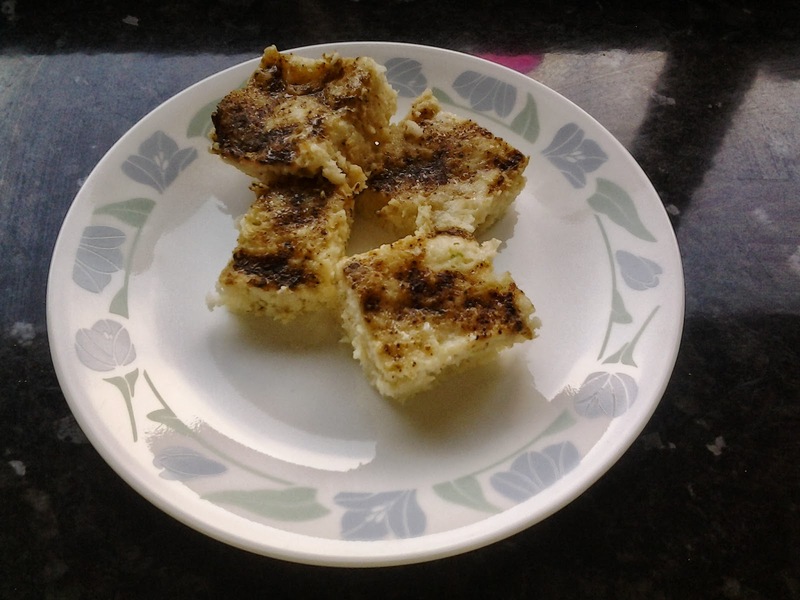 Its very easy and a quick recipe and a great accompaniment to rice or chappathi. 1.In a wok, take oil and add the seasoning ingredients. When it splitters add the diced apple. 2. Cook for about 10 min. Do not overcook as it should not get mashed or pulpy. 3.Now add the salt,spices and jaggery. Mix tillit melts, about 2 min. 4. Lastly add the vinegar. Bottle them when cooled. It keeps in the fridge for a month but its so yummy it won't last that long. 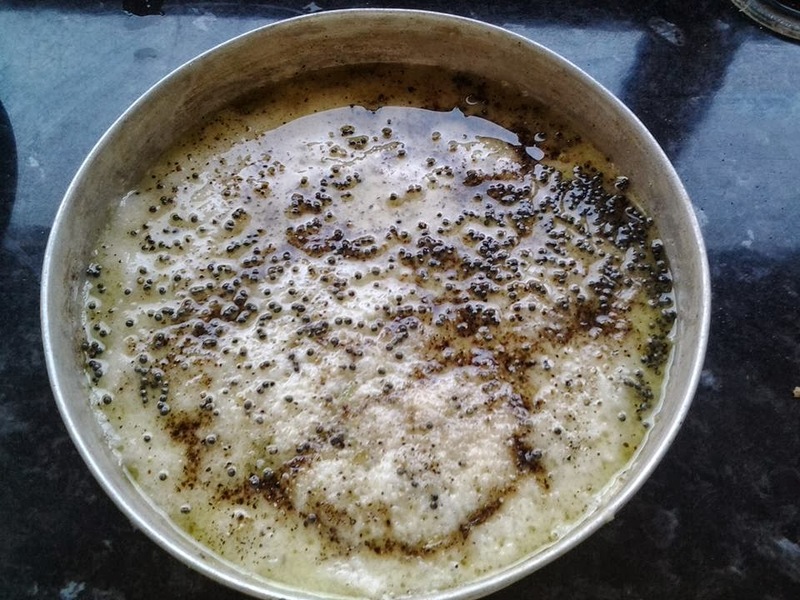 I had idli batter leftover which was too sour for idli, so decided to try khatta dhokla with it, which is meant to be sour. This is the next best thing after Fusion Vada with leftover idli batter, which was made with 1:2 urad dal and idli rava respectively. 1. Add oil, yoghurt, ginger-greenchilli paste and salt to the batter and mix. 2. Grease two plates with oil. Add eno or soda to the batter, give it a quick stir and pour it onto the greased plates. Sprinkle pepper powder evenly. 3. Steam it for 12-15 minutes. 4. 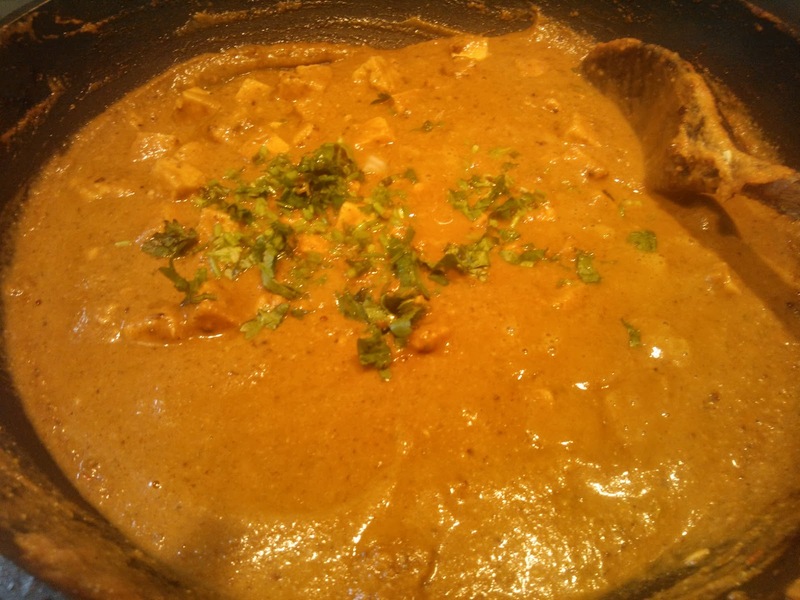 Once ready either you can have it like that or can add tempering of mustard seeds and asafoetida, which is optional. This recipe is written on the back on Mangal tava fry Masala packet. Kids absolutely loved it and taste of this spice is quite unique and exotic. So far I have made bhindi fry, bhindi-shallots and roasted veggies with this and it was the first time I was making a dish with gravy with this masala. 1. 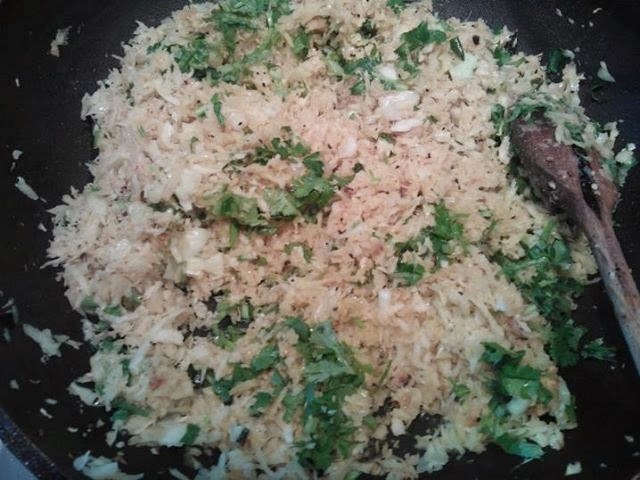 In little oil,add ajwain/thyme and when it sizzles add the finely chopped onions and ginger -garlic paste. 2. If not using a readymade tomato puree, you can grind tomatoes and cashew together and keep it aside. 3.When the onions turn brownish, add the spices. Stir for a minute .Then add the tomato-cashew paste. 4. When it all heats through, add the paneer and simmer it for 5-10 minute till its all well blended. Garnish it with coriander leaves and serve hot with roti, nan or paratha. Hi. I am a mum of 3 kids and work full time as an anaesthetist. I love cooking but at the same time do not want to spend the entire free time in the kitchen. The recipes posted here are easy and simple which will appeal to kids and grown ups. I love to try cuisines from all around the world and adapt them to suit my taste and time. My motto is "keep it simple". I am a vegetarian, so most of the recipes are vegetarian but rest of the family eats non- veg food hence that cooking is done by Ashok. If you have tried any of the recipes then feedback and suggestions are most welcome. Thanks for visiting.